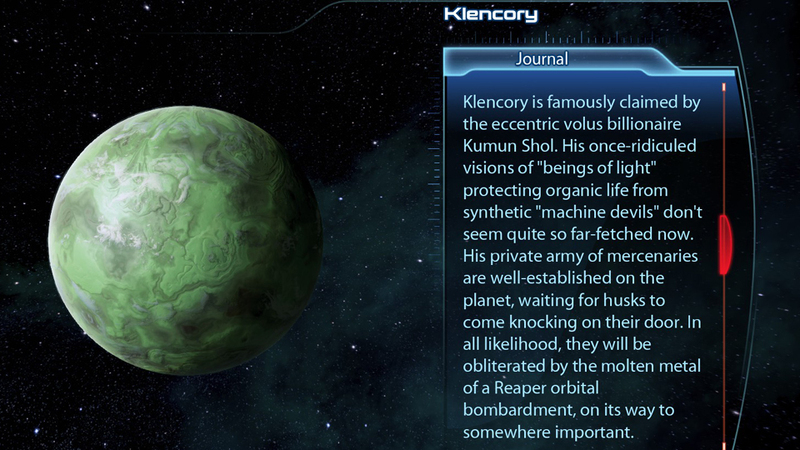 Klencory is famously claimed by the eccentric volus billionaire Kumun Shol. He claims that a vision of a higher being told him to seek on Klencory the “lost crypts of beings of light.” These entities were supposedly created at the dawn of time to protect organic life from synthetic “machine devils.”Shol has been excavating on Klencory’s toxic surface for two decades, at great expense. No government has valued the world enough to evict his small army of mercenaries. 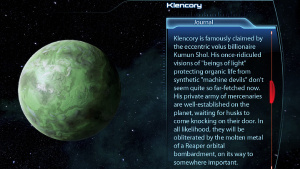 Klencory is famously claimed by the eccentric volus billionaire Kumun Shol. His once-ridiculed visions of “beings of light” protecting organic life from synthetic “machine devils” don’t seem quite so far-fetched now. His private army of mercenaries are well-established on the planet, waiting for husks to come knocking in on their door. In all likelihood, they will be obliterated by the molten metal of a Reaper orbital bombardment, on its way to somewhere important. It might just be a coincidence or it’s possible a BioWare employee had planned this out long ago. It has been pointed out that fans have pointed this out in the past, prior to Mass Effect 3, but at the time it went unnoticed. Only time will tell, or it won’t. At this point we just have to wait for the DLC to see what happens. This morning word came out that the new Sim City, due out next year, will require EA’s Origin and an always-on internet connection. While I’m sure most people are going to cry out about this being another case of needless DRM, this simply doesn’t bother me all that much. I don’t think it is all that ridiculous to require Origin for a PC game made by a company EA owns. Now I’m sure this might get me some hate from people who believe that EA is the anti-christ, or pro-christ if you are not particularly fond of Jesus, but that is how I see it. Plenty of PC games require Steam support whether they use the service for their purchase or not. Now the issue here is that Valve at their least friendly has never provoked the ire of gamers in the ways that EA has over the years. My personal experiences with both EA and their Origin service have always been fairly friendly, or at least lacking in major issues. (Note: I am writing this article while arguing with Origin customer “support” for the third time over an easily rectified account issue.) But, in the end that is the lesser of the two issues. The bigger issue in my book is the required always-on internet connection. At first I thought to myself that people were overreacting in their anger over the requirement. Sim City was announced as having a multiplayer component in the form of an in-game world-wide economy, so why would it not require that kind of connection. If you asked me a month ago I wouldn’t have given it a second though. Now in the wake of EA announcing the closing of servers for multiple games with strong online components it becomes clear that this ultimately might be a problem. Looking at the most recent list of game servers announced for the chopping block it can be seen that a lot of the listed games are no more than 2 years old. This raises the question for me of will I still be able to enjoy Sim City down the road. Normally I would just say that fine, if I still want to play it in 4-5 years I will just have to do so without the online component, but with the required always-on internet connection requirement this might not be possible. A few years from now I might get a hankering for some city-building; install the game and then fire it up, only to find out that it doesn’t exist anymore. Maybe Sim City’s online component won’t work quite like this. Maybe when that time comes EA/Maxis will patch the game to not need online access. I don’t really know at this point, but it is something that has me a bit worried for my gaming future..
Just wanted to throw out a video here. Apparently @miracleofsound the creator of such amazing music as Commander Shepard, Take It Back, and more recently co-creator of Legends of the Frost released a video yesterday showing the easter egg placed into Mass Effect 3 by BioWare. This is confirmed by them, and while it’s not quite what fans had hoped for (something along the lines of full dialogue from the song, or the song being featured as the end credits theme were rumored) it’s still nice that they did something. The above video was created and posted by Miracle of Sound.